The Churchyard is, of course, the home of bookselling, but, as we have seen, as time went on, its children, so to speak, repudiated their birthplace. In the middle of the sixteenth century, for example, Fleet Street contained nearly as many bookshops as the parent locality. In addition to this, England's second printer, Wynkyn de Worde, abandoning the Westminster house of his master, William Caxton, took up his residence in Fleet Street in or about the year 1500. The sign of his shop was the Sun, 'agaynste the Condyte,' and as the Conduit stood at the lower end of Fleet Street, a little eastward of Shoe Lane, we get some idea of the exact locality. He was buried in St. Bride's Churchyard in 1534. W. Griffith was busy at the sign of the Falcon, near St. Dunstan's Church, printing booklets about current events with 'flowery' titles, and these books he sold at his second shop, designated the Griffin, 'a little above the Conduit,' in Fleet Street. William Powell, at the George, was publishing religious books of various sorts, and a 'Description of the Countrey of Aphrique,' a translation of a French book on Africa, which was perhaps the very first on a topic now pretty nearly threadbare. Richard Tottell was dwelling at the Hand and Star, between the two temple gates, and just within Temple Bar, whence he sent forth books by a score and more distinguished men, and whose name is worthily linked with those of Littleton, More, Tusser, Grafton, Boccaccio, and many others. In 1577 Elizabeth granted the same individual the privilege of printing 'all kinds of "Law bookes," which was common to all printers, who selleth the same bookes at excessive prices, to the hindrance of a greate nomber of pore students.' Other Fleet Street booksellers were William Copland, who issued a number of books, T. and W. Powell, and Henry Wykes. Two of the earliest Fleet Street booksellers, Robert Redman and Richard Pynson, quickly got at loggerheads, the bone of contention being Pynson's device or mark, which his rival stole. These are the neighbourly terms which Pynson applies to Redman; they occur at the end of a new edition of Littleton's 'Tenures,' 1525: 'Behold I now give to thee, candid reader, a Lyttleton corrected (not deceitfully) of the errors which occurred in him. I have been careful that not my printing only should be amended, but also that with a more elegant type it should go forth to the day: that which hath escaped from the hands of Robert Redman, but truly Rudeman, because he is the rudest out of a thousand men, is not easily understood. Truly I wonder now at last that he hath confessed it his own typography, unless it chanced that even as the Devil made a cobbler a mariner, he hath made him a Printer. Formerly this scoundrel did profess himself a Bookseller, as well skilled as if he had started forth from Utopia. He knows well that he is free who pretendeth to books, although it be nothing more.' This pretty little quarrel continued some time, and broke out with renewed vigour on one or two subsequent occasions; but the rivals ultimately became friends, and when Pynson retired from business, he made over his stock to 'this scoundrel' Redman, who then removed to Pynson's shop, next to St. Dunstan's Church. The bibliopolic history of Fleet Street is almost synonymous with the literary history of this country. Anything like an exhaustive account, even so far as relates to the bookselling side of the question, would be quite out of place in a work of this description. A few points, therefore, must suffice. Apart from the booksellers already mentioned, the following are also worthy of notice. At the latter part of the sixteenth century Thomas Marsh, of the Prince's Arms, near St. Dunstan's, issued Stow's 'Chronicles,' and was the holder of several licenses for printing; for nearly half a century J. Smethwicke (who died in 1641) had a shop 'under the diall' of St. Dunstan's, whence he issued Shakespeare's 'Hamlet,' 'Love's Labour Lost,' 'Romeo and Juliet,' 'Taming of the Shrew,' as well as works by Henry Burton, Drayton, Greene, Lodge, and others; Richard Marriot was in St. Dunstan's Churchyard early in the seventeenth century, and his ventures included Quarles' 'Emblems,' 1635, Dr. Downes' 'Sermons,' 1640, and Walton's 'Compleat Angler,' 1653, for which 1s. 6d. was asked, and for a good copy of which £310 has been recently paid; Marriot was also the sponsor of the first part of Butler's 'Hudibras,' 1663. Thomas Dring, of the George, near Clifford's Inn; John Starkey, of the Mitre, between the Middle Temple Gate and Temple Bar, the publisher of Shadwell's plays, and for some time an exile at Amsterdam; Abel Roper, of the Black Boy, over against St. Dunstan's Church, and publisher of the Post Boy newspaper; Thomas Bassett, with whom Jacob Tonson was apprenticed; Tonson himself, of the Judge's Head, near the Inner Temple Gate (he started in Chancery Lane), are Fleet Street booksellers of the latter half of the seventeenth century. Early in the following century we get such names as Benjamin Tooke, of the Middle Temple Gate; Edmund Curll, whose chaste publications appeared from the sign of the Dial and Bible, against St. Dunstan's Church; Bernard Lintot, Tonson's great rival and Pope's publisher, of the Cross Keys, between the Temple Gates; Ben Motte, who succeeded Tooke; Andrew Millar, Samuel Highley, John Murray, and many others who might be mentioned, but who were publishers rather than second-hand booksellers. One of White's best customers was the eccentric George Steevens, who, however, discontinued his daily visits, after many years' regular attendance, for no real cause. He then transferred his attentions to Stockdale's, whom in turn he abruptly forsook. The elder Benjamin retired from business with 'a plentiful fortune,' and died at his house in South Lambeth in March, 1794, and Benjamin junior retired to Hampstead a few years after his father, leaving the business to a younger brother, John, who continued bookselling until the earlier part of the present century, when he, in his turn, gave up active work for the 'enjoyment of a country life' with 'an easy competence.' In one of the catalogues of this celebrated firm—our copy is minus the title-page, but it was evidently issued about 1790—four of the most interesting entries occur among the folios: Caxton's 'Lyfe of the Faders,' with 'curious old wooden plates, not quite perfect, in Russia,' is priced at £5 5s. ; Caxton's 'Lyfe of our Lady,' by John Lydgate, is offered at 10s. 6d. ; a fair copy of Caxton's 'Lyfe of St. Katherine of Senis' is figured at £10 10s., the price asked also for a 'fair, not quite perfect' example of the 'Golden Legende.' A Second Folio Shakespeare is priced at £4; a Fourth Folio at £1 7s. The same catalogue includes a copy of the famous 'Book of Hawking and Hunting,' printed at St. Albans in 1486, but unfortunately the price is omitted, as is the case with several other important rarities. The Whites published some fine natural history books, including those of Pennant, Latham, and White of Selborne; the last was a relative of the booksellers. Whiston was succeeded by Nathaniel Conant, who sold, inter alia, the library of Samuel Speed, 1776, and John White was succeeded by his partner, J. G. Cochrane. Sixty years ago Charles Tilt, afterwards Tilt and Bogue, occupied 85, Fleet Street, and a charming view of this shop appears in Cruikshank's 'Almanack' for March, 1835. 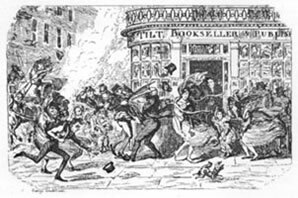 Although the bookselling history of Fleet Street did not cease with the general migration of booksellers, from the end of the last to the beginning of the present century much of its glory as such had departed. During the second and third quarters of the nineteenth century its bibliopolic annals are indeed few. One of its most interesting houses was situated at No. 39, upon part of the site of the present banking-house of Messrs. Hoare. Here formerly stood the famous Mitre Tavern; this place was much damaged during the Great Fire, and was partly rebuilt. In the last century it was a favourite resort of Wanley, Vertue, Dr. Stukeley, Hawkesworth, Percy, Johnson, Boswell, and many other celebrities. Johnson and Boswell first dined here in 1763. It was here that the 'Tour to the Hebrides' was planned; it was here also, at a supper given by Boswell to the Doctor, Goldsmith, Davies, the bookseller, Eccles, and the Rev. John Ogilvie, that Johnson delivered himself of the theory that 'the noblest prospect which a Scotchman ever sees is in the highroad that leads to England.' From 1728 to 1753 the Society of Antiquaries met here, and for some time also the Royal Society held its meetings in this place. In 1788 the tavern ceased to exist, and the house became the 'Poets' Gallery' of Macklin, whose edition of the Bible is described as an unrivalled monument of his taste and energy. Thomas Macklin died in 1800, and the erstwhile Mitre gave place—possibly not at once, but certainly very soon after—to Saunders' Auction-rooms. The most important sale which occurred here, and of which we have discovered any record, was an anonymous one in February, 1818; the catalogue was entitled 'Bibliotheca Selecta: Library of an eminent Collector, removed from the North of England.' This sale occupied six days, and comprised a very fine series of books of old English poetry, history, topography, and illustrated books. For instance, a very fine copy in a genuine state of the First Folio Shakespeare realized the then high figure of £121 16s. A copy of Yates's 'Castell of Courtesie,' 1582, sold for £23 2s., Steevens' copy eighteen years previously going for £2 10s. A large number of other excessively rare books, several of which were unique, were sold here at the same time; but whose they were, or how they could have drifted into such an unimportant auction centre as Saunders', are questions which we are not able to answer. Fifty years ago there were at least three important firms of literary auctioneers in Fleet Street—Henry Southgate (who eventually turned author, and who died about three years ago), at No. 22; L. A. Lewis, at No. 125; and E. Hodgson. At each of these three centres many extensive collections of books came under the hammer. When the elder Southgate died or retired, in about 1837, two of his assistants, Grimston and Havers, left, and started on their own account at 30, Holborn Hill, making the auction of books a speciality; but their existence appears to have been brief. The neighbourhood had, however, a book-auction repute long before the present century dawned, and the Rose Tavern, near Temple Bar, was a favourite locality for this method of selling books. Samuel Baker here sold the entire library ('Bibliotheca Elegans') of Alderman Sir Robert Baylis in 1749, and that of Conyers Middleton, Principal Librarian of the University of Cambridge, March 4, 1750-51, and nine following days—by order and for the benefit of the widow, who in the preface 'takes this opportunity to assure the public that this catalogue contains the genuine library of Dr. Middleton, without any alteration, and is sold for my advantage'—there were 1,300 lots.